Our mission. We, the Alternative Banking group, are dedicated to making the financial system work for the 99% by pushing for better financial regulations, by evaluating and fostering wholly alternative financial options, and by educating the public about the current dysfunction to inspire activism. Participate! Explore this web site for information about the financial system, the economic crisis, and how we as concerned citizens can make things better. 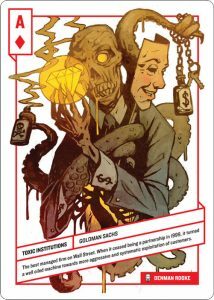 Check out our book, Occupy Finance, as well as our extensive News and Noteworthy pages. And if in New York, join us on Sundays for discussion and check out our speaker series. Contact us at alt.banking.ows@gmail.com to get meeting notices or anything else. Who we are: We are financial professionals technologists, economists, engineers, housewives, househusbands, laborers, students, activists and workers interested in reforming, revolutionizing and improving our financial system and the world. We’ve been meeting since October 17th, 2011, soon after Zuccotti Park was occupied and since then we discuss and act regularly. Public protest at JP Morgan Chase’s headquarters in support of the New Day New York City-Wide Day of Action and other actions. View the New Day New York Coalition Report. Enjoy the book, enjoy the cards, activate your community!